One question I seem to get a lot is “What do you do with your time?” To be honest our life up here is pretty awesome. We have lots of time to play with the kids, swim in the pool, we get to spend time together, go to day spa’s and get massages, take the kids out and just enjoy a slower pace of life. This is a real treasure for me as I have young kids and spent most of our life in Australia rushing around like a mad woman trying to get everything done! One of the lovely perks of living up here and having a little extra time is that I get to indulge each week in my wonderful ceramics class. I love my little art class every Wednesday afternoon. It is a mixure of lovely ladies (and one lovely guy) from around the world and it is a great place to just turn up, relax and play with stuff that feels good! I love playing on the wheel and my latest creations are a set of icecream bowls for all four of us and a large salad bowl. 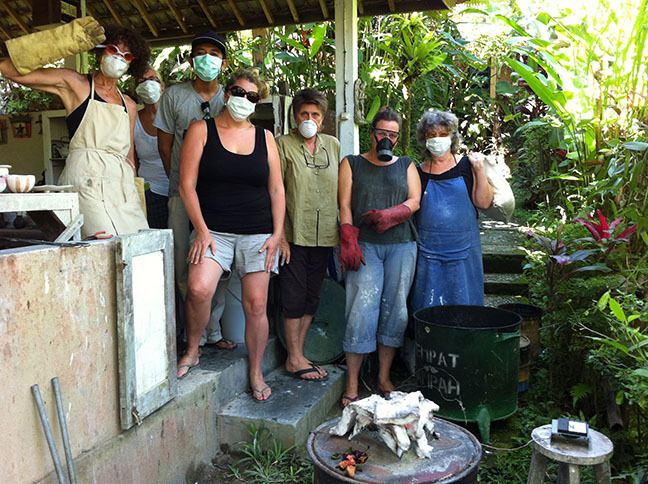 They are still in the kiln which can take over a month as we are on ‘Bali time’ however I was super lucky to be part of a Raku firing where we got to experience the wonderful ancient art and also benefit from taking our pieces home with us on the day. A little background …. Raku is a type of Japanese pottery that is traditionally used in the Japanese tea ceremony, most often in the form of tea bowls. 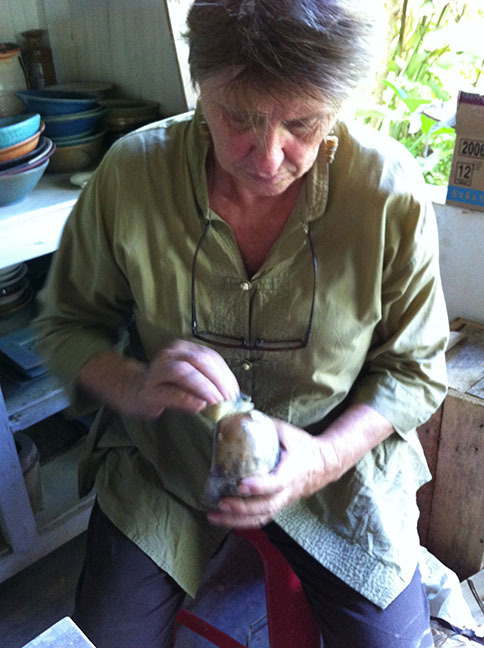 It is traditionally characterised by being hand shaped rather than thrown; fairly porous vessels, which result from low firing temperatures; lead glazes; and the removal of pieces from the kiln while still glowing hot. 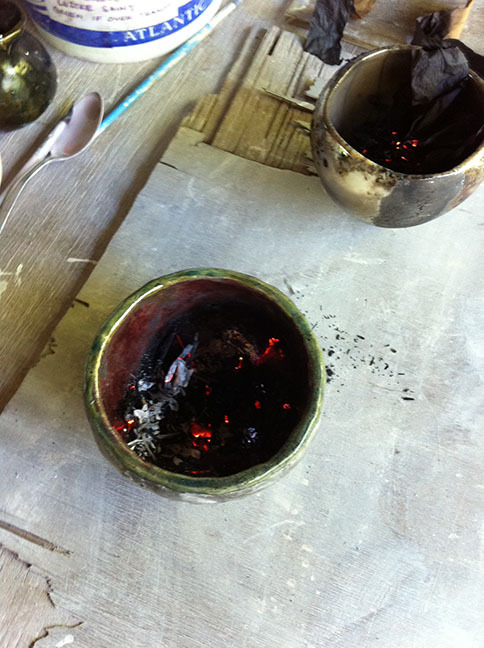 In the traditional Japanese process, the fired raku piece is removed from the hot kiln and is allowed to cool in the open air or in a container filled with combustible material. 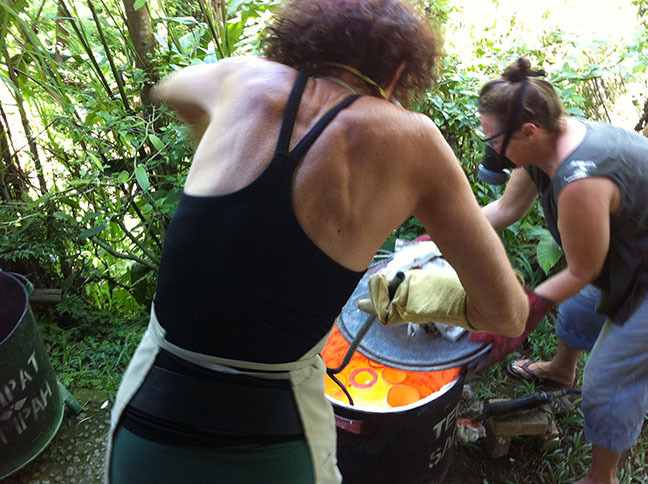 Raku techniques have been modified by contemporary potters worldwide. As we are in Bali things are always a little different. My ceramics class is set in an open air studio on the side of a hill. The views are divine and the feeling of creating something unique there is somewhat very special. We have lots of freedom to do as we choose. 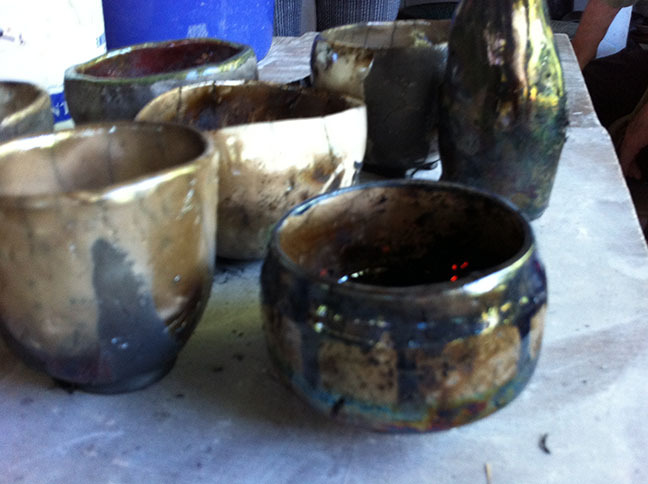 Little side classes like this Raku firing are a lovely distraction. One other interesting and somewhat amusing part of life up here is participating in processes where OH&S doesn’t exist but perhaps in the Western world they might (e.g. 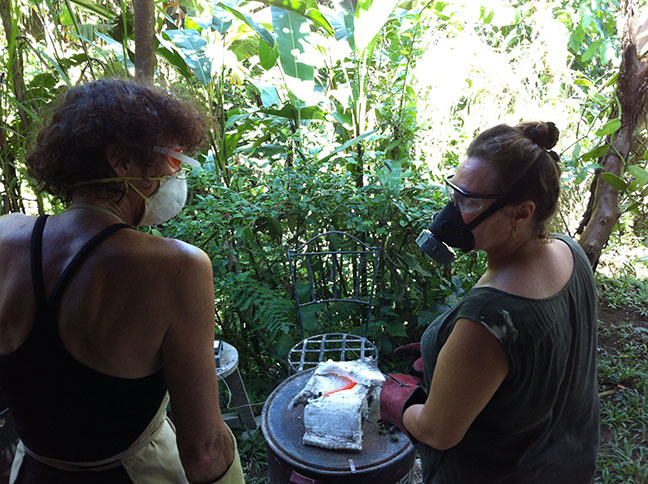 we wore thongs next to the 900 degree kiln) and because lots of things are hard to find, you often have to make do! 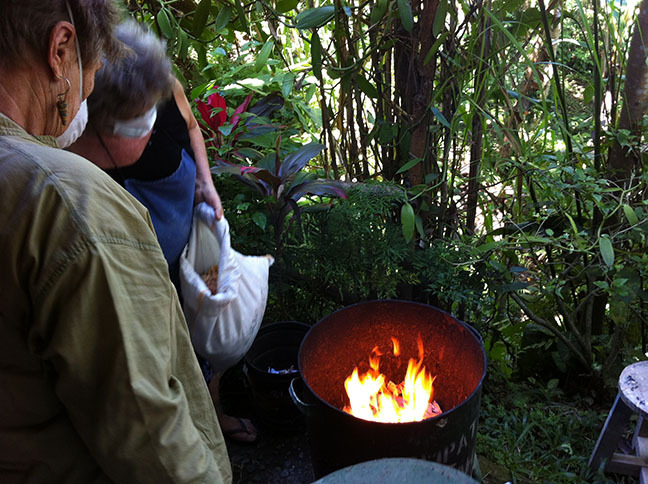 I managed to find some face masks in our local supermarket (courtesy of living in one of the few countries that still sells leaded petrol) as the smoke from placing each piece in a bucket of flammable material was terrible and I think one of the ladies who got right into the kiln to pull stuff out was using swimming goggles as eye protection ….. however with common sense ‘miraculously’ we all survived and it was a great day! 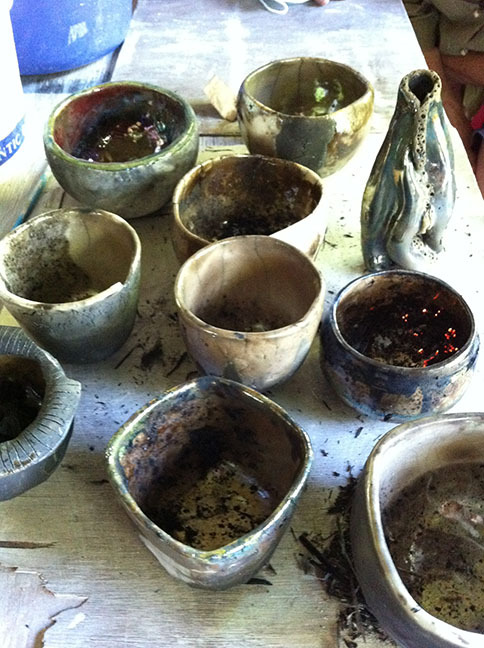 All of us had prepared pots/pieces in advance that had been bisque fired. 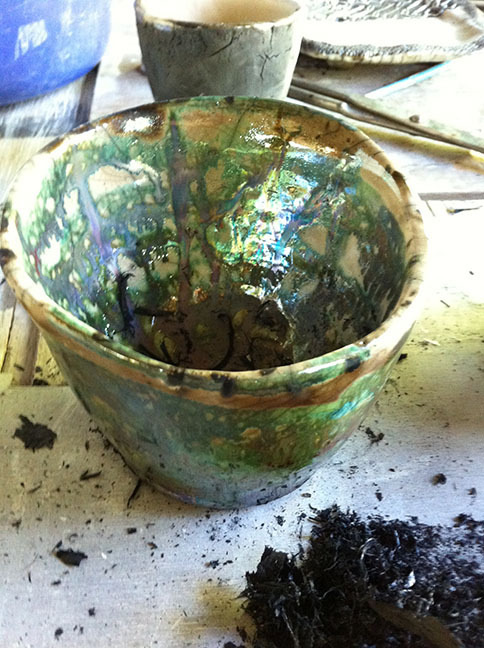 We then applied different glazes as we liked. Some people covered their whole piece in glaze, others splashed it around in patterns. I couldn’t decide, so I did both. 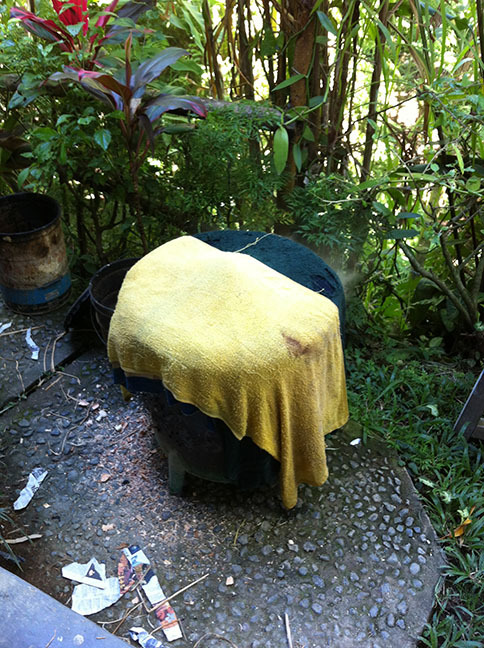 The little Raku kiln was placed outside our studio on the ground. It can get up to 900 degrees and as the top is open we could see the glowing interior. Being loaded with the first batch! 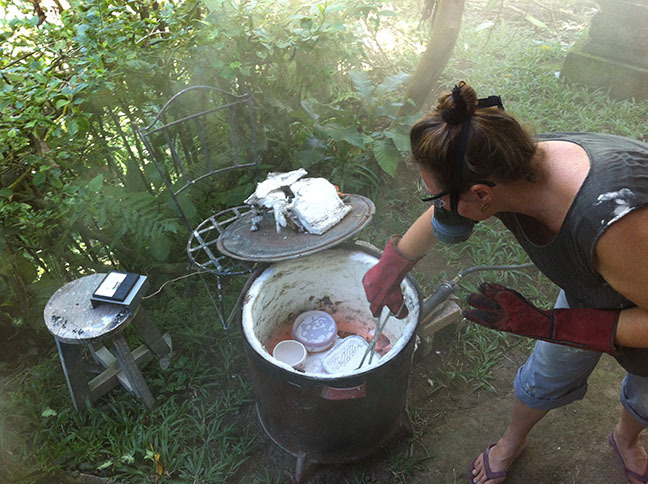 Getting the first pot out of the blazing hot and glowing Raku kiln. Throwing it into a trash can filled with ripped up newspapers, sawdust/woodchips and dried banana leaves. Basically anything that will immediately ignite. 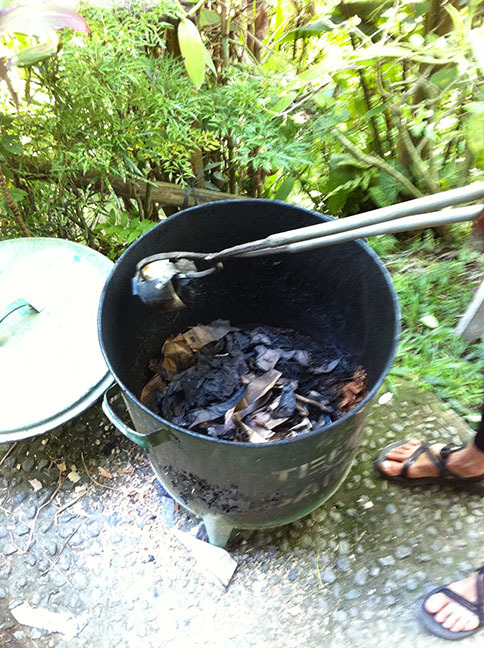 Pulling the first pot from the embers about half an hour later. It was completely black and covered in soot. After a quick wipe with a towel we could see the beautiful colours appear! Embers still sitting in the pots. Sometimes the soot is hard and needs to be cut/chiseled off. Polishing leads to wonderful discoveries! It is a little bit like Christmas! 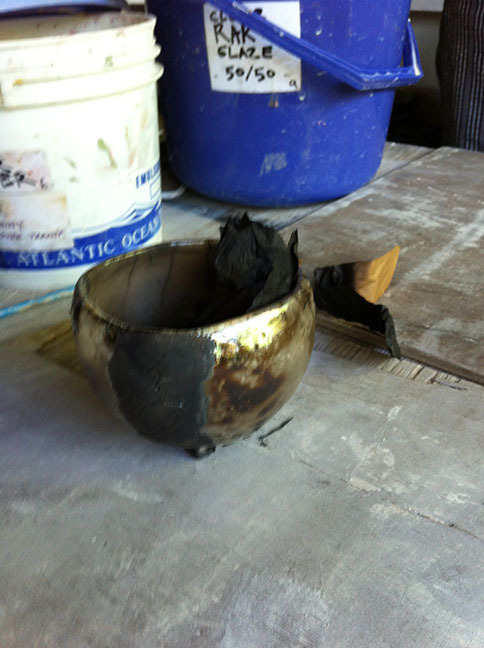 My Raku Bowl! I love it! My own little piece of Raku! Brilliant! That bowl looks so well done. If you ever get sick of looking at it, you can send it my way.